When American soldiers come forward with tales of divisive evangelism run amuck in the military–for example, proselytizing by commanding officers, coerced attendance at revival meetings, distribution of Bibles to Afghanis or Jesus coins to Iraqis– one problem they face is that people find the stories too outrageous to be credible. 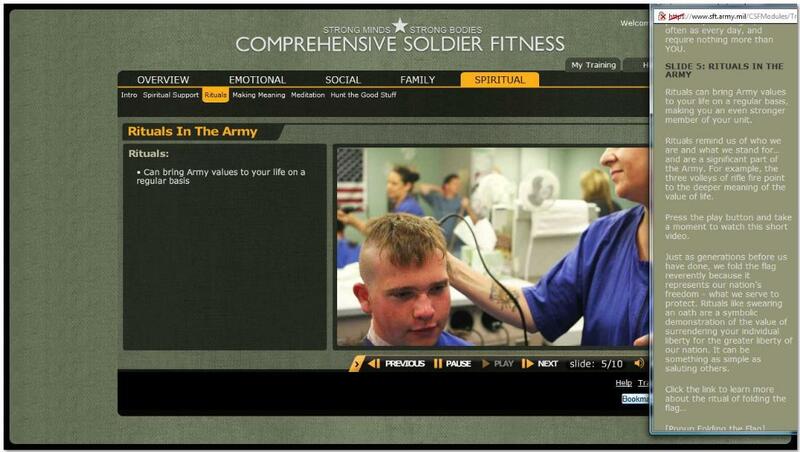 A combat soldier being forced to pick hairs out of a latrine because he wouldn’t pray? Another being told he’s responsible if any of his buddies die? An Iraqi child post-IED given a tract that shows dead Iraqis going to hell and Americans (aka Christians) going to heaven? 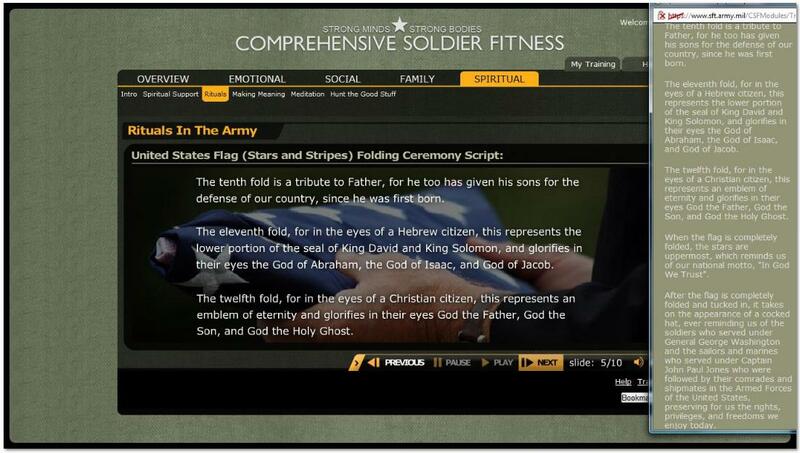 Some folks have accused the Military Religious Freedom Foundation of making this stuff up. Military officials insist that each event was the isolated actions of individual soldiers and lacked official sanction. One recent scandal left little room for such framing. 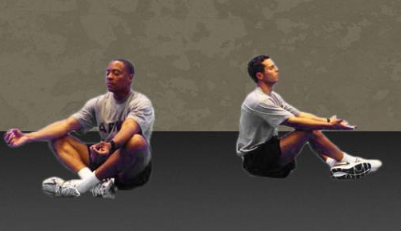 Soldiers flooded the MRFF (pronounced murf) with complaints about an obligatory “spiritual fitness test” on which freethinkers got docked points for their lack of religion, and some got referred to mandatory counseling –with chaplains. Two hundred twenty six have signed onto a lawsuit to block the test, which is required annually for active duty soldiers both at home and on tours of duty. The military has gone to great lengths to insist that spiritual fitness is not a religious concept. 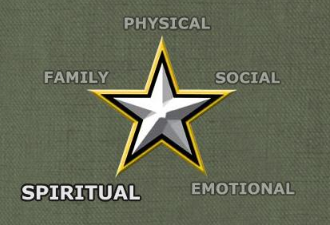 Intermixed with images of bowed heads and identifiable Christian symbols is a repeated emphasis on spirit as a secular term, as in “team spirit.” In fact, one of the spiritual rituals that appears repeatedly in the training materials is a time honored military haircut, which appears repeatedly in more or less iconic form in the spiritual training materials. The sixth fold is accompanied by the words of the post 1950’s pledge of allegiance, with its modestly divisive insertion of the words “under God” between one nation and indivisible. But the truly divisive words don’t appear until the next page. At this point the ceremony becomes one that is uniquely and specifically relevant to conservative Evangelicals and other Christian fundamentalists. The eighth fold makes explicit reference to Jesus “the one who entered into the Valley of the Shadow of Death” and to a specific kind of conservative Christian theology: “That we might see the light of day” represents “atonement theology” in which the death of Jesus is seen as essentially a blood sacrifice, a propitiation for human sin. Atonement theology is widely adopted by Evangelicals, Pentecostals and orthodox Catholics but rejected by many mainline Protestants and modernist Catholics. The eleventh fold pays tribute to the God of the Old Testament , “the God of Abraham, the God of Isaac, and God of Jacob.”(sic) Holding forth the Hebrew lineage within a fundamentally Christian sequence calls upon a theological precept known as supercessionism—the idea that Christianity supercedes Judaism as God’s covenant with the human race. The twelfth fold, which produces the traditional triangle used for honorable storage of the flag is cited as a symbol of the doctrine of the trinity by which the Roman Catholic Church at the Council of Nicea resolve the question of whether Jesus was fully human or fully divine. 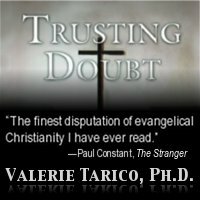 Like the other doctrines described above, it is a tenet of belief for some Christians and not others, and patently irrelevant for practitioners of other faiths. Gallery | This entry was posted in Christianity in the Public Square, Musings & Rants: Christianity, Uncategorized and tagged Christian Flag Folding, Church state separation, Military Comprehensive Fitness, Military Religous Freedom Foundation, Spiritual Fitness test. Bookmark the permalink. Valerie – I love your blog! I read it all the time. I am so grateful for the message you send to the world – one I need to hear repeatedly. It encourages me because I am a deconverted Christian. Please keep up your wonderful work. Thank you, Jay. 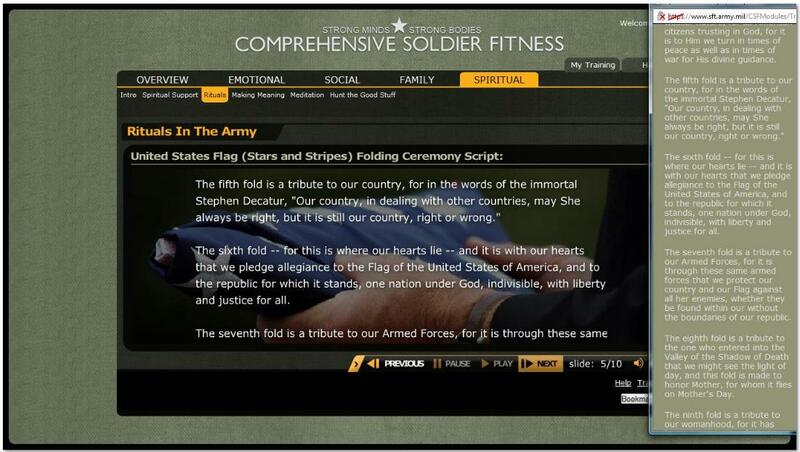 What Snopes debunked was the idea that this meaning was ever originally intended in the flag folding ceremony. That is why it is all the more ironic that it actually made it into the training manual for the U.S. Military “Comprehensive Fitness Program.” The photos are real and were taken from the army’s online training for their soldiers. In the face of outcry, they have been removed along with some of the other more egregious examples of church-state violation in the training materials. I will add a quote from snopes and a link in the article, because your point should be clearer. Hello my name is Libby and I am a Christian. However when it comes to defending my life and my country it is not just a christian duty. It is everyone’s duty to protect life. I just want to know that someone out there is willing to die for my right to live, to laugh and to love. My relationship with God is just that and my belief is mine. If however one wants to know about my faith I will share it. But defending one’s country and one’s family is everyones responsibility. As I see it, having the Lord on my side in a battle is much better than going it alone. The exact and deliberate wording of the constitution on religion is ‘Congress shall make no law respecting an establishment of religion, or prohibiting the free exercise thereof’. Nowhere does the phrase separation of church and state appear nor does the amendment state the government won’t have a faith in God. To the contrary, the only thing stated is Congress won’t make laws respecting a specific religion. I would like to state that our government having a healthy fear of our Lord Jesus Christ and making laws in respect to a certain religion are 2 very different subjects. Having a “healthy fear of our Lord Jesus Christ” is respecting a certain religion.